Home Mammals Carnivorous Mammals Can Raccoons Climb Trees and Fences? Raccoons are one of the most adaptable mammals. They have this amazing ability to survive in almost any surroundings. Since they are easily habituated to humans, they often occupy habitats that are close to human settlements. It seems like raccoons have little to no fear of humans which is why they can conveniently live in suburbs and cities. Therefore, most people are curious about them and wonder can raccoons climb trees or fences? Even though they are nocturnal animals, people often see them wandering during the day. Now let’s explore the climbing abilities of these fascinating creatures. Raccoons may appear cuddly and fuzzy little creatures, but they are masked bandits. They are strong enough to climb up trees, fences or walls. Raccoons have got flexible and powerful body structure. They can easily clamber up uneven and rough vertical structures. However, it is not easy for raccoons to climb up trees that has smooth surface. They can grip trees quite easily thanks to their ever-growing claws. By means of their claws and hind legs, they manage to claw their ways up to the treetops. 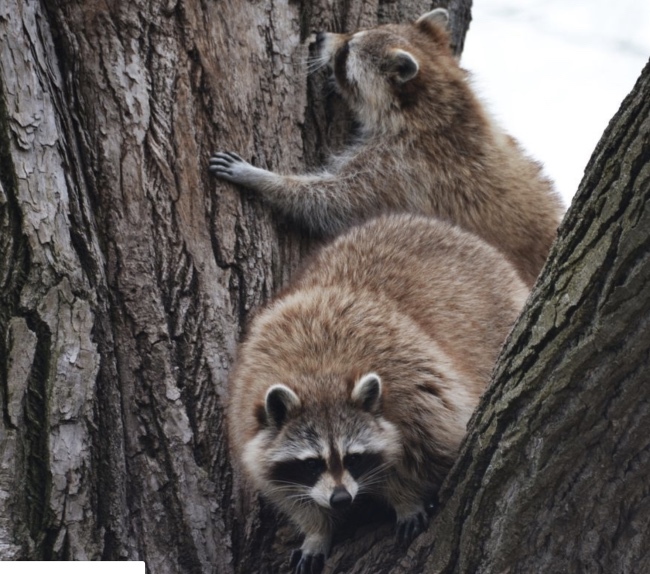 The hind legs of raccoons are strong enough to lift them up the treetops. Learn more: Where Do Raccoons Sleep? Not only trees, raccoons can easily climb up concrete and other fences that may be as high as 10 feet or more. Because they are excellent climbers, they tend to find their way into the chimneys and attics and play havoc with the walls. If the fence is made up of softer materials like soft wood, they can clutch them and make holes within that. However, they can conveniently climb fences that are rough and uneven. If the fence is made up of metal, it would be very hard for them to go over it because its surface is slippery and smooth enough to climb. Likewise, raccoons cannot climb unweathered metal sheet and glass. Baby raccoons can also climb fences but not more than 5 inches high. But a fully grown raccoon can scramble up fence of more than 8 inches. Learn more: Where Do Raccoons Live? Apart from fences, raccoons can scramble over almost any other vertical structure provided its surface is rough. Thus, they can easily climb up brick and stone walls, wooden structures and masonite siding. However, it is very difficult for raccoons to climb vinyl siding because of the texture of the surface. Learn more: Are Raccoons Rodents? In reality, there are strong claws at the end of raccoon’s front paws. But what’s more amazing about their climbing abilities, they can rotate themselves to 180 degrees and climb down trees or even bricks head first.